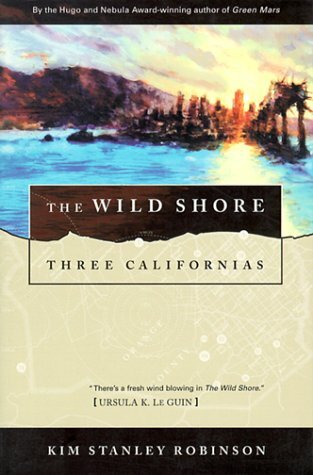 The Wild Shore is the first novel published by Kim Stanley Robinson, in 1984, and the first of the Three Californias triptych (or Orange County trilogy). In an America "after the fall" in the future, the coming of age story of a young man living in a pastoral village in California. It follows the account of teenager Henry Fletcher in the shores of what used to be Orange County, in an America that tries to recover from the nuclear war that it fell victim to. The novel opposes the views of a violent effort to rise America from its ashes to restore its past grandeur and a sense that the clean slate the war offered is an opportunity to correct past mistakes. The novel is composed of four parts, for a total of 23 chapters. 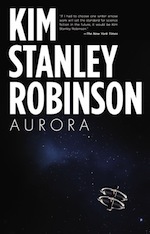 It is one of few of KSR’s novels written in the first person, a fact explained in the narrative in the end (the novel consists in the written account of the narrator’s experiences). The story moves from Henry’s small community to a larger scope, progressively revealing the truth on the political situation. The narrative consists of a series of scenes linked by descriptive prose. As we move closer to the conclusion, the text becomes more and more descriptive, reflecting the literary ambitions of the narrator. The novel takes place over the course of less than a year (beginning of summer 2047 to February 23rd 2048). Henry Fletcher lives in the small community of (San) Onofre, population about 60, in a valley at the coast of the Pacific. The year is 2047 and after the nuclear attack that suffered America in 1984, life has returned to a pastoral simplicity. The inhabitants of Onofre specialize themselves in one task or another, each contributing to the living necessities of the community. They live mainly on fishing with their small boats, and agriculture. When it rains everybody helps covering the fields with plastic tarps. A bathhouse, full with warm water, can be a gathering place. Economy is reduced to a monthly swap meet inland, where people from different communities gather to exchange goods. Higher North in Orange County live the scavengers, people living off the ruins of the past, doing trade and shady business, generally badly regarded or feared by the honest valley dwellers. Off the shores, patrolling ships of the dreaded Japanese can be seen. Though the exact truth has been disfigured by lore, it would seem America was attacked with nuclear bombs by the Soviets as a preventive measure; since then, America has been kept quarantined from the rest of the world, its development hindered by higher forces. Henry and his friends, Steve Nicolin the leader, Kathryn, Kristen, Gabby, Del and young Mando, are all teenagers. Steve is with Kathryn, whom Henry regards as an older sister, and Henry might have something going with mysterious Melissa. Henry and Steve are taught by Tom, an old-timer who lived even before the Day of the attack; they learn how to read and study literature. Tom is full of stories of the past, of exploits and achievements of America, wonders enough to fill the imagination of the young. And though some of them are outright fantasies, he always swears they are the truth. One day, a group of people, led by Jennings and Lee, appear: they’re from San Diego and are slowly rebuilding the train tracks, connecting the communities. They would welcome representatives of Onofre to take them to their respected Mayor. Henry and Steve, thirsty for adventure, want to join Tom in the journey. But Steve’s father John, highly regarded in Onofre, refuses to let Steve go. Life is hard and each pair of hands counts. Henry and Tom join the San Diegans heading South on their manually-operated train. Though they are not sure of the extent of the satellite surveillance from the Japanese, they make sure to leave few traces; when they cross a river, they build a small bridge and deconstruct it right afterward. They reach San Diego; built on a half-destroyed freeway is the Mayor’s house. They join the banquet there; Henry is bedazzled by the richness of the place. Mayor Danforth, a colorful and imposing character, explains they are trying to reunite America, to bring back her past glory; and with fire guns at their disposal they are ready to use violence against the Japanese. Onofre is urged to join them but Tom is silent. They are repairing a radio, and have a book printing facility that rebuilds American culture. The bookmaker gives them a print of recent literature, “An American Around the World” by Glen Baum, and a blank book for Tom’s stories. Heading back towards Onofre by sea, their ship is spotted by the Japanese; a gunfight ensues, and Henry is captured. He is interrogated by the Japanese, who justify their patrols as a decision by the United Nations. He gets to escape by jumping overboard; back on the shore he’s happy to find Tom alive. Through the cold wind and rain and long walk they finally reach Onofre. In Onofre, the group of friends spends time reading Baum’s book. It is an account of the writer’s voyages (after the Day) to Catalina island, Japan, Russia and round the world back to San Diego. It shows that in fact the rest of the world is not better off without America around, but in fact are simply ruled by a different set of imperialist powers instead; the succession of unrealistic adventures and exploits increases disbelief; Tom laughs knowingly and Henry loses interest. The return for San Diego calls for a valley meeting, to decide whether to join the resistance movement or not to change their way of life. Nationalistic and isolationist views clash. John and Tom’s opinion prevails and Onofre will answer negatively to San Diego. However, mainly under Steve’s influence, the group of friends secretly decides otherwise. Henry, Melissa and her father Addison Shanks discuss and later Henry realizes they’ve been pumping information about the San Diegans from him; he discovers the Shankses secretly collaborate with the scavengers, who trade with the Japanese. Steve and Henry meet with Jennings. The San Diegans are going to strike the Japanese who come by boat to Orange County; it seems tourists come and, with the help of collaborationist scavengers, visit around, as if America was a wildlife reserve. Steve promises to provide them with the date and place of the landing of the Japanese, information that Henry will have to get from the Shankses – though Henry’s uncomfortable with that. Eventually, Henry spies on Addison and they end up confronting each other; under the threat of Henry revealing what he knows to the rest of the valley, Addison gives away the information. Tom falls heavily ill. At Henry’s surprise, Tom gives the blank book to him, for him to write. Tension is afloat; Steve and his father argue again and again; Steve argues with Kathryn. Tom reveals to Henry that in his stories, more often than not, lied and embellished the past, to give them hope. For the first time he tells him the truth about the reason America was murdered the Day of the attack, the crimes committed by America against the rest of the world and the reason people hated them, how crazy everything was, how many then died of famine. Henry doesn’t understand and is confused by Tom’s two contradictory views – that they live in the ruins of the past, and that the past was awful. Tom knows his warnings not to go to Orange County won’t be heard. Steve, Henry, Gabby and Mando join the San Diegans (with the Mayor, but without Lee), who provide them with guns, and lead them to the expected landing point at Orange County. The Japanese come by submarine, they’re welcomed by scavengers; the San Diegans and the boys open fire. But, as the scavengers had been warned by Shanks, the attackers are overwhelmed by the returning fire and retreat. Amid the chaos, Mando gets shot. The boys are rescued by Rafael’s repaired cart. Mando dies in the hands of his father. After the funeral, Steve takes a boat and leaves, sailing for Catalina and adventure. In the aftermath, the Shankses depart from Onofre and the valley learns Lee became the new Mayor after the previous one was killed in the ambush. Henry wanders aimlessly, thinking and observing nature numbly; he knows he could have prevented all of this. Tom recovers, time passes, after the harvest comes winter. Henry writes, and he finally starts a relationship with Kathryn. He is now in on the valley’s big decisions with Tom and John: resistance is a goal on a longer term, for now they should destroy the rail tracks, then having a radio would be a start. Henry finishes his book, freed of Tom’s lies, and now thinking for himself.